Hunts Cross is a station on the Liverpool Lime Street to Warrington Central line and has three platforms, two of them on an island. There is a waiting room and toilets on this latter platform. Merseyrail trains from Liverpool central terminate here and on this line the line is electrified on a third rail. Our three car EMU pulls into a wide cutting and crosses over onto the mainline tracks as overhead gantries appear above us. We then pass sidings and a shed on the right as we pass under the mainline from Liverpool to Crewe, which continues to run beside us on the right. There are more sidings on the right, but these are empty and then we come to a stop at Liverpool South Parkway, which has been rebuilt from the original Allerton and Garston stations in recent years. It has four platforms, two for each line. As we leave there are signs that there were once four tracks here. We go into another cutting as we pass a children's play area in the old track bed on the right. We then slow and stop at Cressington station, which is also in a cutting. The original large red brick station building is on the right. There is a smaller red brick building on the left side. We move off into a deep brick lined cutting and travel for about a mile before we arrive at Aigburth (For Otterspool Promenade). There is another large red brick station building on the right platform. We go into another cutting, before passing some houses and then woods on the right. We go into another cutting, though you can see the tops of houses on either side. We then go into our first tunnel, doing about 50 mph. We emerge to houses on both sides and then go into another tunnel, before emerging at st Michaels. It has large walkways on both platforms and a large yellow-framed shelter on the left, with nothing on the right. We pass some allotments on the right and then go into our third tunnel, the longest one so far. We then pass a large gas cylinder on the right and factories on the left and then stop at Brunswick (For Brunswick Business Park). It has the same yellow-framed shelters as at St Michaels on the left and right platforms. The line curves to the right now and enters another brick lined cutting, before going through a series of four tunnels, before arriving at Liverpool Central. 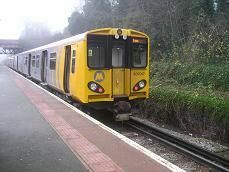 Up until the 1980's the train would arrive at Liverpool Central High Level, but when the Merseyrail system took over, the line was moved underground linking up with the line from Southport, which originally terminated at Liverpool Exchange. Liverpool Central (Northern Line station has just two platforms on an island, whilst the lower Liverpool Central (Wirral Line) station now has just a single platform.